Which Is The Best Boys State Meet Of The Weekend? MA, MI, NJ, PA, Or VA? 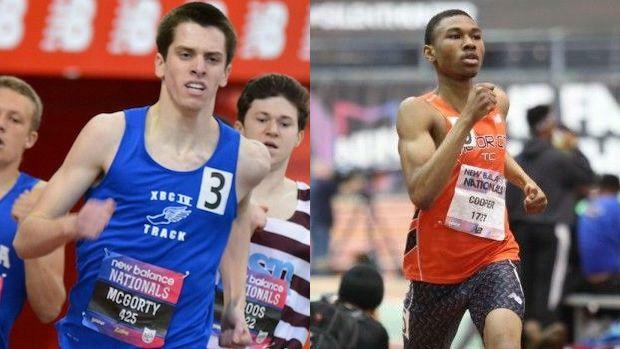 Two of the nation's best in sub 1:50 half milers Brandon McGorty and Cameron Cooper will both be starring in their respective indoor state championship meets this weekend in Virginia and Michigan. This weekend will see five major state championship meets, three of which you can watch LIVE on MileSplit or Flotrack (MileSplit universal upgrade needed to view) in Massachusetts (MIAA All-State Meet), Pennsylvania (PTFCA State Championships), and Virginia (VHSL 5A/6A State Championships). Meanwhile, MileSplit will be on-site with archived video and photo coverage at the New Jersey Meet of Champions and the Michigan Indoor Track Series (MITS) Indoor Championships on Saturday and Sunday. With so many great choices to watch this weekend LIVE or on demand...what would be the best state meet to watch? Well, we decided to help you in the decision process by combining the top performers in common events across each state for an All-Star meet scored by state. Let's take a look at the boys scoring, matching up the five states with championship meets this weekend. Team Virginia appears to have the advantage over Team PA, and Team New Jersey is in close pursuit. Similar scoring for the girls events to come later today.